It took us a little while to get our bearings in the Barossa because it's made up of a few different towns, with 10-20 minutes driving time between them. We went straight to Maggie Beer's farm shop in Nuripoota where I sampled everything on offer and Maggie popped in to say hi, which was so exciting :) It was too cold for a picnic but we still enjoyed a lovely lunch in the sun from the cafe and went for a walk around her property. Fun fact - the supermarket in the Barossa stocks every flavour of her ice cream line, including ones I'd never seen before. Artisans of the Barossa was recommended by a friend because it stocks six small wine labels. We deliberately skipped breakfast so that we could take full advantage of the 'Feed me like a Barossan' menu at Harvest Kitchen, which is part of the Artisans set-up and it was a highlight of the trip. There was fried chicken, insane fig and beef empanadas and a salted caramel and popcorn sundae that Tony had to fight me for. Because we ate so much during the day, we never got to eat dinner in the Barossa but FINO in Seppeltsfield came highly recommended, and we poked our heads into the JamFactory that is in the same complex to see the studios and check out the craft and design shop that's downstairs. We bought local camembert from a cheese shop on the main street of Angaston after learning that it only needed to be refrigerated of a night and could come on the road trip with us - thank goodness it was winter - and then returned the next day for breakfast burgers at Barossa Farmers Markets where Maggie was spotted again :) Casacarboni, a well-known Italian cooking school, was closed while we were there but looked pretty great from the outside. We stayed in a really cute shed beside a vineyard but if we visited again, we would probably stay in Tanunda just to be in walking distance of a town and the German hotdog shops of a night. Of all the wine regions we visited, McLaren Vale was the prettiest. We had some excellent recommendations, which led us to Samuel's Gorge, a cellar door that specialises in red wine and overlooks a national park. The wine was delicious but a little bit pricey so we bought a bottle that we're going to save for a special occasion - we're aiming for our 10 year wedding anniversary! Chapel Hill is nearby and while we didn't buy any wine, I did stock up on the most delicious roasted almonds. 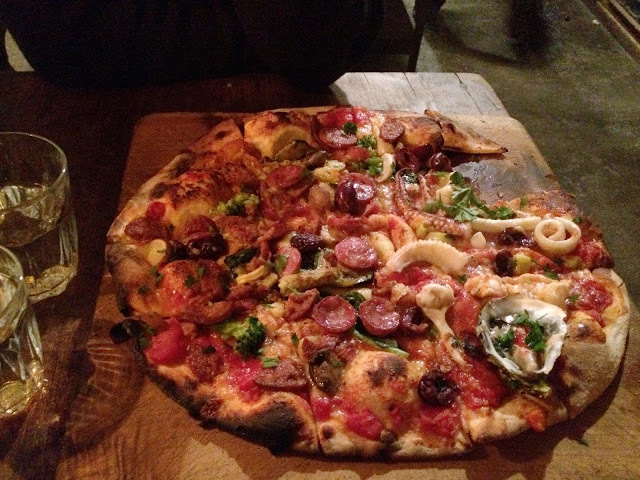 I made sure that we were in McLaren Vale on a Saturday night so that we could try out a special pizza restaurant that my friend Angie discovered a few years ago. Russell's Pizza is a local institution and is only open Friday and Saturday nights. I booked months in advance! The seafood pizza was hands down the best pizza I've ever eaten and I loved that the restaurant was inside an old stone house. We were in the Clare for just one night and loved how cosy it felt. We rode part of the Riesling Trail, past vineyards and bonfires (next time I'd hire a bike from here) and discovered wineries in little clusters that were quite close together. We especially liked Tim Adams, Pikes Brewery (for beer I actually liked!) and Mr Mick. If we had more time, I would've loved to have had lunch at Mr Mick's kitchen. Tony was keen to try the local beers on tap at the Sevenhill Hotel and we ended up having dinner in their wine cellar. If you're planning a visit, we found this website really helpful. We drove to South Australia via the Victorian town of Mildura and stayed there on the first and last night of our trip. Everyone kept talking about Stefano's so we booked in for the surprise seasonal dinner and on our way home we discovered The Mildura Brewery, a beautiful art deco building where pub-style meals are available from Stefano's. Amanda suggested The Grand Hotel, and staying there felt like travelling back in time. Big thanks to Caryn for sharing some of her favourite South Australian spots. Soon I'll share what we got up to in Adelaide.